A innovative new diet to help with joint pain and mobility in cats. This extraordinary prescription diet is Hill’s feline J/D. J/D is clinically proven to improve mobility in as little as 30 days for your feline friend. It’s packed full of essential Omega-3 and 6 fatty oils that help your cat walk, run, play, and jump easier, plus it’s nutritionally balanced. 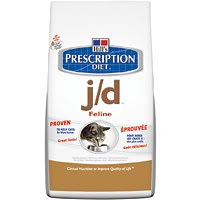 Ask us about J/D and see if your cat would benefit from this great new food. PS – J/D is also available for your canine companions too! This entry was posted in Hill's, J/D, new feline food on June 30, 2010 by yourfriends.